Save the Timber is dedicated to the preservation of the ancient oaks and hickories and the unique landscape that is part of Timber Trails, Western Springs, Illinois. 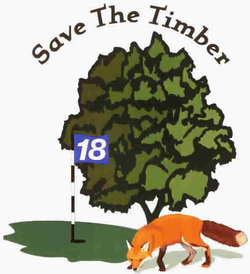 Save The Timber is an Illinois not-for-profit corporation formed in 2004 to help preserve the beautiful landscape and the hundreds of ancient trees on the site of the former Timber Trails golf course. Check out our video, which we put together in 2005. Save the Timber was formed in 2004, when it was announced by the owners of the Timber Trails Golf Course that their land would be sold at an auction that year. We quickly developed not only the video above, but also a campaign to use state law to float a bond issue to obtain funds to purchase 25 of the Timber Trails acreage for a park. The bond issue was approved November 2, 2004 by a 21,483 to 19,767 margin. Unfortunately, the new owners, Dartmoor Homes, refused to sell and the state law had been amended to prevent the use of eminent domain to obtain the 25 acres. After developing the Timber Trails infrastructure -- sewers, water, roads -- and building several dozen homes and townhouses, Dartmoor was unable to pay against their original 2004 loan, a victim of the 2008 real estate crash. The lending bank foreclosed on Timber Trails. In 2012, Medley Capital purchased Timber Trails from the foreclosing bank, and announced plans to restart development. We remain committed to saving those parts of Timber Trails still covered by stands of oaks and hickories. We hope you are too.